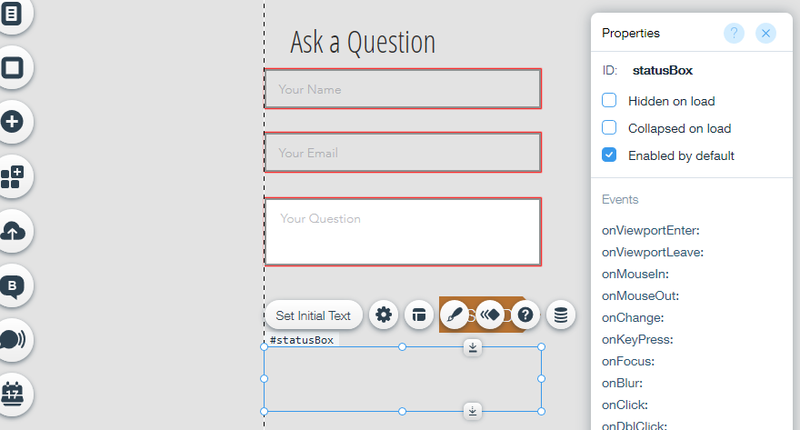 In this quick example we will see how we can use Wix Code to create a custom form that saves into Database collection and do simple back-end validation. Go to the Wix Editor > Tools > tick Developer Tools. In the Site Structure sidebar > Database > click "+" button > New Collection. Name it "Question". Since in this example the collection is only viewable by admin, select "Private Data" in the permissions drop-down. In the Content Manager at the right of the header row, click "+" button to add 3 text fields to your collection. Name, Email and Question. For security, will put the Database access code in a back-end web module which runs in server-side only. In the Site Structure sidebar > Backend > click "+" button > New Web Module. Name it "Question.jsw". Then click the Gear icon next to module name > Set Permissions > Anyone. 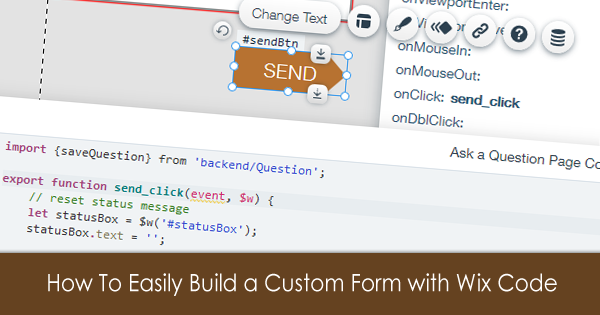 Code starts by doing back-end validation on submitted Name, Email and question. Then, query latest question with same email from database. And if one was found, will check it is not in the past 24 hrs as a simple check. Then insert the new question. // in the past 24hr ? Now will create a new page and create simple form as in the following image. Will also create a border-less read-only text area for displaying result message. Right-click > View Properties : to set its ID that will use in the client-side code. Double-click : to set settings like Input type, required, placeholder text, length limit. Create a button and right-click > View Properties then Hover over the onClick event, click the + sign, and press Enter. Now, the code panel expands and the click event handler is added to your code. Then checks that form inputs are valid. Then call the back-end function. Simple! Thank you for taking the time to comment..